Lets Food Cities : encouraging the shift towards sustainable food systems at a local scale through better cooperation. Within the framework of the Milan Urban Food Policy Pact and existing mecanisms for decentralized cooperation, the Let’s Food Cities project aims to encourage cities to transition towards sustainable food systems at a territorial level. The project operates by supporting the implementation of decentralized cooperation projects between French and foreign cities. The seven French signatory cities, and seven foreign twin-cities are targeted. Let’s Food Cities’s goal is to identify the challenges to each city’s food system, as well as the alternatives and innovations whose implementation and/or spotlighting would prove beneficial. Understanding the underlying issues and key stakes is a first step towards integrating them in decision-making processes, leading to inflections in policy which can provide the impulsion for building territory-based, sustainable food systems. The French partner cities will also benefit by finetuning their strategies for decentralized cooperation. Develop an axis in support of sustainable food within the international co-operation strategies of the 7 French cities involved. 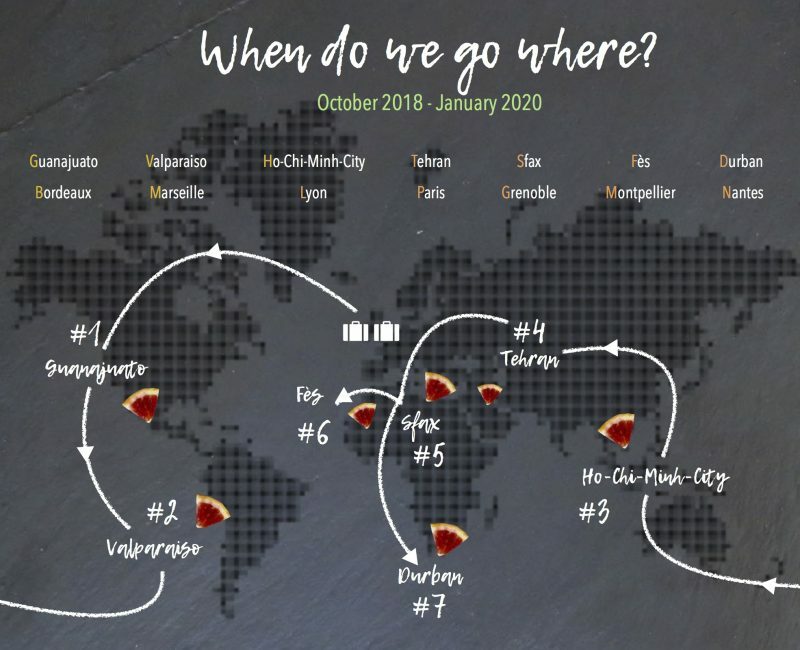 Foster the sharing of experience, knowledge and initiatives on the topic of sustainable food in the 7 French cities that are signatory to the Milan Pact and their corresponding twin cities. Encourage and accompany new food projects in the twin cities with the support of French cities. Once the duos of cities are established, a preliminary assessment report of each of the 14 selected cities is carried out by volunterring students hailing from 22 different French universities. This step cements our understanding of the local food systems and helps us identify possible areas of collaboration between the two cities. The mission in each foreign city is dedicated to: producing a short film illustrating the local food system and its main stakeholders, organizing a workshop with these stakeholders in order to collectively identify possible action plans, hold a festive event, in attendance of local authorities, to give present the findings and raise public awareness on the topic of sustainable food systems. Upon the return to France, we present the results and findings to the partners of the project, including local authorities in each city and universities. To this end, we produce a film featuring a narrative of the cities and the initiatives encountered and a compilation report intended for publication; these will be widely diffused thanks to a series of national and international conferences.